Air Group 4, made up of fighting, bombing, and torpedo squadrons, experienced a kamikaze attack on the carrier Essex on November 25, 1944. Sixteen crewmen lost their lives when the plane crashed into the flight deck. This web site tells Air Group 4's story during World War II and includes a few pages related to kamikaze. 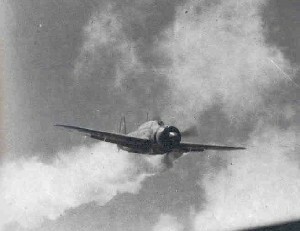 The article "Suicide Tactics: The Kamikaze During World War II - Air Group 4" gives a brief summary of Japan's kamikaze operations and provides details about kamikaze attacks on Air Group 4 ships or nearby ships. Both this article and other pages on the site effectively utilize historical photos related to the attacks. Much of the information in these two chapters comes from interviews with crewmen and pilots. The Air Group 4 web site goes beyond other Internet material published by World War II veteran groups. This site not only covers the battle details of the kamikaze attacks experienced by Air Group 4 but also briefly addresses the general history of Japan's kamikaze. For example, the site includes a review of Naito's Thunder Gods, a book on the men who piloted the ohka glider bombs in suicide attacks.